The upgraded line-up starts with a new Q70 2.2d model, powered by a four-cylinder diesel engine developed as part of Infiniti’s strategic cooperation with Daimler. Mated to a standard seven-speed automatic transmission with paddleshift (depending on model), the new 2.2 diesel unit in the Q70 emits just 129g/km of CO2 while offering stirring performance thanks to 170PS and a generous 400NM of torque. 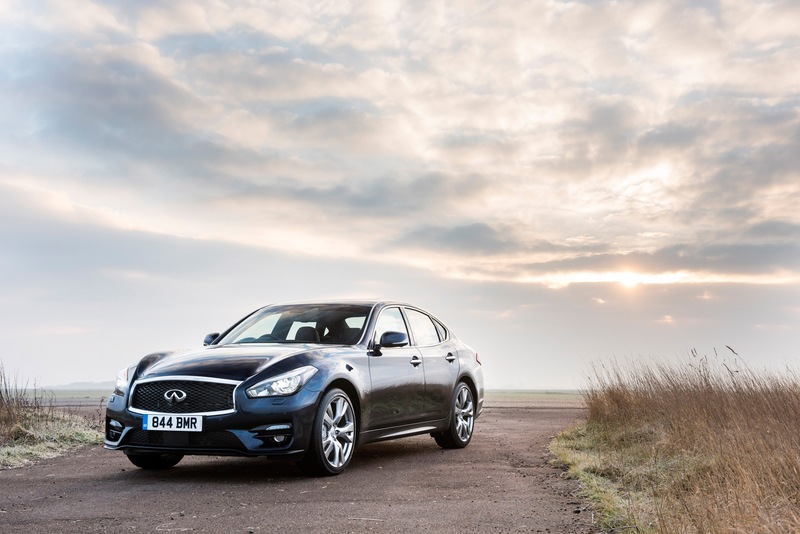 Replacing the 3.0-litre V6 diesel in the Q70 range, the new Q70 Premium 2.2d is priced from £32,650. The car comes as standard with full LED headlights, chromed accents on the front grille, a rear-view camera, front and rear parking sensors, with standard Connectiviti+ navigation, 18-inch wheels and leather seats with ventilation, in what is a typically generous Infiniti standard specification. It is expected that such attractive pricing for a large premium saloon endowed with exceptional technology and equipment will make the new Q70 2.2d model the most popular variant in the UK market. Other versions in the new line-up comprise of ‘Sport’, with an even more expressive look to the front bumper, uprated brakes and 20-inch wheels, among other changes. Available with selected Premium and Sport models, Tech models come with Infiniti’s Dynamic Safety Shield (intelligent cruise control, lane departure prevention and blind-spot intervention), Bose Premium Surround Sound with 16 speakers and Around-View Monitor with Moving Object Detection and Forest air-conditioning. As well as the new 2.2 diesel engine, the Q70 for 2015 is available with both 3.7-litre V6 petrol power and, for the flagship, the award-winning Infiniti Direct Response Hybrid powertrain. Benefiting from the enhancements introduced on the Q50S Hybrid, the latest Q70 Hybrid offers even more performance – accelerating from 0-62mph in just 5.3s – and better efficiency, with CO2 emissions at 145g/km. Marking their European debut at the Paris Motor Show last October, the latest Q70 models are upgraded both under the skin (with improvements to refinement and ride comfort) and above it. A new, more chiselled look to front and rear bumper sections enhances the seductive shape while bringing the Q70 closer to the new family look introduced with the Q50. The headlights retain the distinctive Infiniti design but, for all models in the range they are full LED, like the rear lights. This entry was posted in Car Updates & Releases, Executive Cars, Luxury Cars, Manufacturer News, New Cars, News and Views and tagged infiniti q70, lease an infiniti q70, new infiniti by David Petherick. Bookmark the permalink.